My family are all sewers, and have always been ever since I was born so it was natural for me to grow up and be interested in sewing. I have sewn my own dress before but it was a costume for my Textiles GCSE in school; not something I'd actually wear (check it out here!). Over the summer I vowed to make a dress that I would actually wear and make use of! I took inspiration from my Mum's gorgeous vintage dress from 'Lindy Bop'- a gorgeous floral midi dress, inspired by 50s Audrey Hepburn. I bought this pretty cotton material from Trago Mills at only £3.50 for two metres! I love the amazing cornflour blue colour and delicate pink floral pattern. 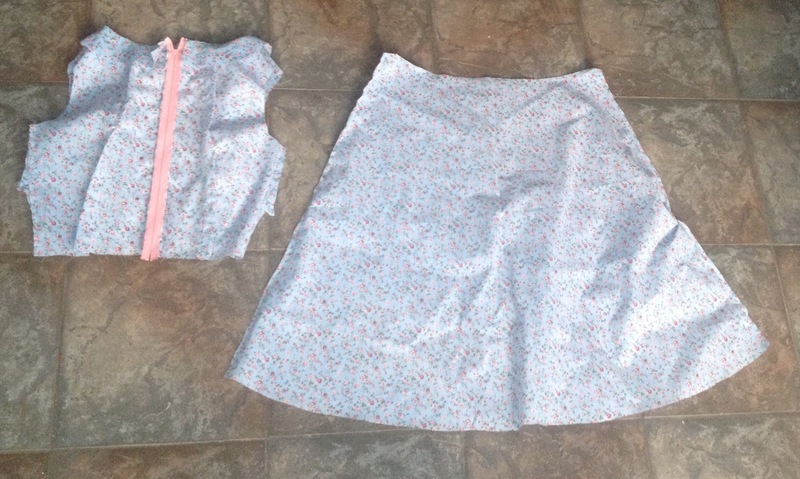 I used a free dress pattern from my Mum's Prima magazine to cut out the basic pattern pieces I needed, however because I have made garments before I didn't have to use any instructions and just sewed it from memory (and common sense!). 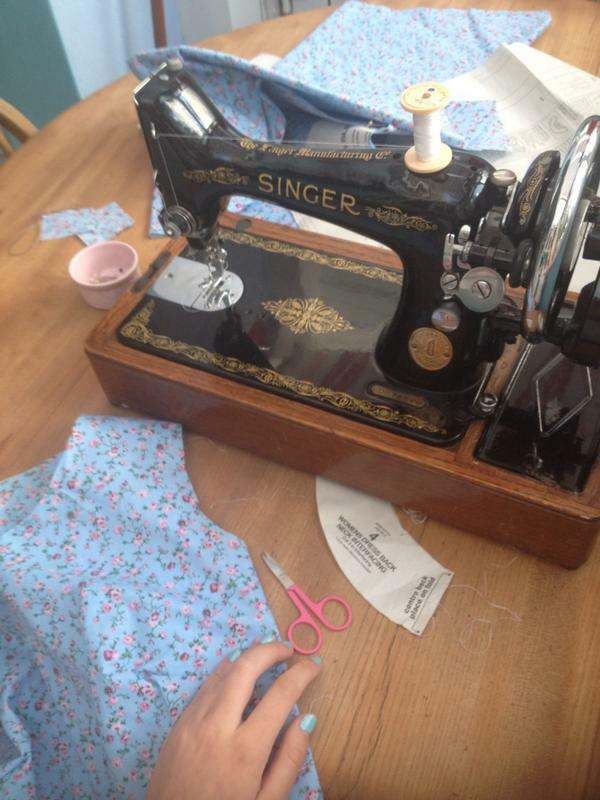 Of course, I used my (ancient) Singer sewing machine, but it is always such a pleasure to use! I sewed darts in the front of the top to add shape to the bust, also I sewed some darts in the back because it seemed that the material was too baggy around my back and shoulders so darts shaped it a bit more. I'm still looking to buy a hook and eye to secure the top of the zip. I bought a pink zip to easily fasten the dress. The zip was around 80p. I decided to sew the zip so that it is visible from the outside of the dress as I loved how the colour stood out against the blue but coordinated with the pink flowers! And this is the finished dress! I'm really pleased with the outcome of this dress- its really feminine and cute but still very fashionable, with a nod to the classic 50s Audrey style. I love sewing my own clothes and would urge anyone to try and do so because it makes the garment so personal and unique to you. A lot of people are somewhat scared of the concept of sewing as they have never been taught how, but with helpful resources like YouTube and blogs, its so easy to learn the basics! Sewing workshops and classes are also a great way to learn how to sew. I can't wait to start sewing some more advanced garments in the near future!